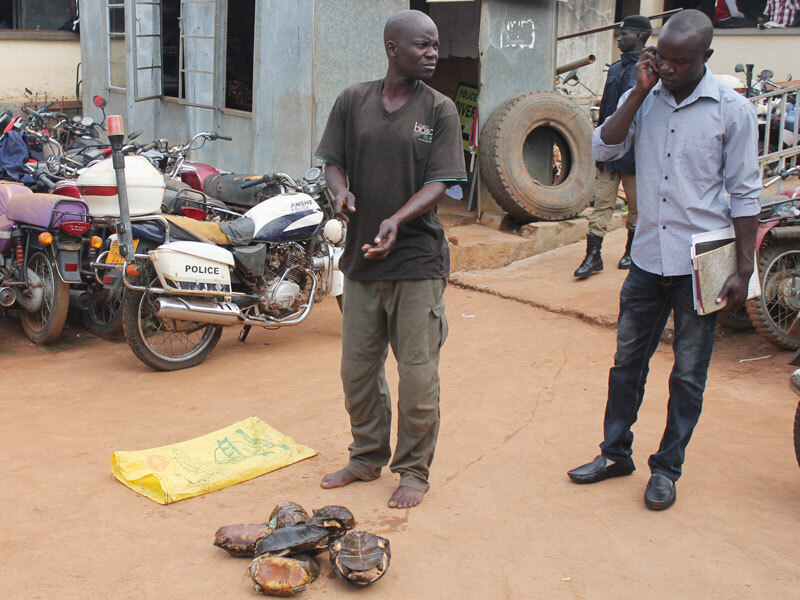 Omony (L) at Gulu Central Police Station with the tortoises. On the phone is Marcelo Okoya. Devid Okema. AMURU. Police in Gulu are holding a man over illegal possession of tortoises in a fish farm located in Akurukwe village Lacor Parish in Amuru district. Marin Okoyo Gulu District Police Commander said Police arrested Denis Omony last on suspect of illegal possession of protected wildlife species. Okoyo said Omony, 35, was arrested from Akurukwe village in Lacor Parish where the fish farming project is located after they were informed that the suspect was seeking to sell eight tortoises. Peter Marcelo Okoya, manager of the Pukure Integrated Fish Farm, said they have been dealing strictly in fish since 1975. He said Pukure fish farm is located in a swamp in Akurukwe, which harbors several amphibian species and reptiles. “When we are using fishnets, the nets trap anything in the ponds, including snails, tortoises, fish and sometime snakes and we release the unwanted species back into the swamps,” Okoya said. He added that the tortoises that were found on the farm were in the channel of water outlet because they are predators to fish. However, in what appeared like a contradiction, the fish farmer told journalists that the tortoises left on the farm sometimes serve for learning purposes, including for Gulu University agriculture students. Meanwhile, Benard Massa, head of prosecution at Natural Resource Conservation Network, said a person found in illegal possession of protected wildlife species is liable to a jail term of five years or a fine not less than Shs1 million if found guilty, according to Uganda Wildlife Act Sections 30 and 75(b). “We are going to charge Omony on two counts of unlawful possession of wildlife species and conspiracy to sell protected species. Because Omony is being used by his father Marcelo Onencan, who initiated the project that keeps protected wildlife species without licence from National Wildlife Authority,” Massa said. Joshua Poro, media officer at Natural Resource Conservation Network, said there has been unconfirmed allegation that tortoises were being sold to Chinese living in Gulu town at Shs60,000 each but investigations are ongoing to on the matter. Poro said that, so far this year, they have recovered 23 tortoises in different operations.